Moose, the world's largest member of the deer (Cervidae) family, are prevalent in most areas of the state. They can be found from the Unuk River in the Southeast Panhandle to the Colville River on the Arctic Slope, a span that includes many large Alaskan communities and numerous villages. In Alaska, people and moose have been neighbors for thousands of years. Both humans and moose prefer the same low-lying habitat adjacent to rivers and streams, causing them to come into frequent contact. These large ungulates are valued by hunters, wildlife watchers and tourists. While not normally aggressive, moose can become dangerous if provoked, so it is important to know how to respond if you encounter an aggressive moose. The key to coexisting with moose is to avoid confrontations by giving moose plenty of space. Never approach a moose! 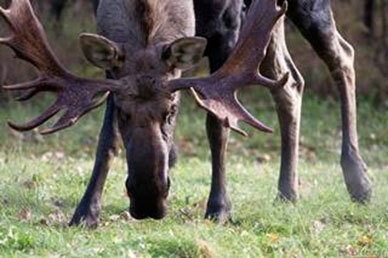 Moose-vehicle collisions pose the greatest danger to both people and moose. 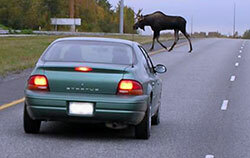 Look out for moose on roadways especially in winter when moose-vehicle collisions are most common. For more information, see Driving in Moose Country. It is illegal — and dangerous — to feed moose. It can cause them to become aggressive. Moose sometimes cause problems when they eat ornamental shrubs or agricultural crops. Despite these nuisances, moose are considered by many to be a symbol of life in Alaska. Living in close proximity to them is part of what makes life in Alaska unique. Learn more about moose in our moose species profile.